But ultimately our customers coined the name “Joosy Froot.” Joosy Froot is a craft-beer crowd favorite. This truly tropical beer treats your taste buds with citrus aroma and tangy mango flavors. Joosy Froot is your crushable Florida IPA. 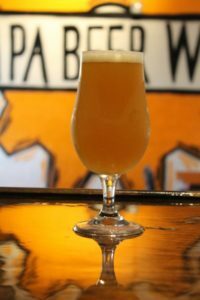 SRM: 5 Joosy Froot is a special orange-mango-tangerine treatment of Saint Bosco NEIPA. Joosy Froot NE-IPA’s orange-tangerine-mango dances on the Saint Bosco’s notes of grapefruit and apricot. Lightly bittered with juicy flavors, this craft-beer’s light/refreshing body is accented the noble hops and triple dry-hopped with Citra hops for it’s juicy finish and haze.